I went to Target today because I was down to my last roll of toilet paper at home. So as a responsible adult I headed out to replenish my stock of bathroom essentials, but I was also hoping to browse the Halloween section of the store. This was a less “responsible adult” inclination, I admit. Unfortunately I was disappointed on that account. The back corner of the store that’s usually dedicated to selling products related to the next holiday on the calendar was sadly still decked out in back-to-school fashion. What a shame. I know some kids don’t start school again until after Labor Day, but it’s finally September, for crying out loud! Time for the holiday festivities to begin! But maybe that’s just my own impatience talking. I’ve been waiting eight whole months for this day! (One of my friends actually started decorating her front yard for Halloween today so I’m clearly not the only one who is excited for this time of year. And if my Halloween door hanging wasn’t tucked away so far in my closet I’d have started decorating today too.) However, I did find one holiday surprise in the bath products section of Target. Remember how last December I was obsessed with getting my hands on a bottle of Mrs. Meyer’s Apple Cider Clean Day Liquid Hand Soap? Here’s an excerpt from my retail therapy #2 blog post to refresh your memory. Well, as of today this previously coveted hand soap is available at my local Target at a reasonable price. Makes me feel silly for going to such great lengths last year! Not that I’ll be lining up to buy any this time around because I realized that I can experience the same scent profile from the Suave Kids 3-in-1 apple shampoo that I use at the gym! 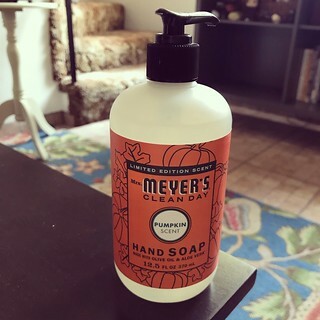 However, I did find Mrs. Meyer’s pumpkin hand soap, a variety I was previously unaware of, sitting on the same display shelf. I was intrigued. I bought so many bottles of holiday hand soap last December that I won’t even get close to finishing them by the end of 2018. So, thinking practically, there was absolutely no reason I needed to purchase pumpkin-scented soap today. 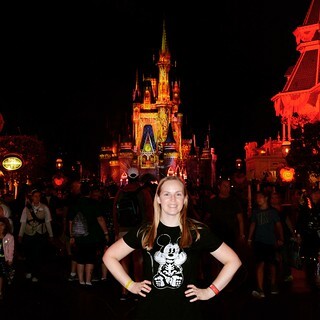 In fact, my pledge to be more frugal for the rest of the year (I have two Disney World vacations coming up, and those aren’t cheap) is a prime reason that I shouldn’t have put any of the pumpkin hand soap in my shopping basket. But I did anyway. What can I say? My resolve weakens when I’m faced with special edition holiday stuff! Luckily hand soap is on the low end of the spectrum, price-wise. Let’s hope I have more willpower when it comes to other, more expensive and more compelling items. Like the gorgeous glass pumpkins at Pottery Barn. I must be strong! I’ve posted a lot of chili recipes over the years and I like every one, but some have greater mass appeal than others. Judging by my successes and failures at the annual chili cook-off at work, the common factor in my most popular chilis is bacon! My co-workers fall all over themselves for a taste of anything with bacon in it. 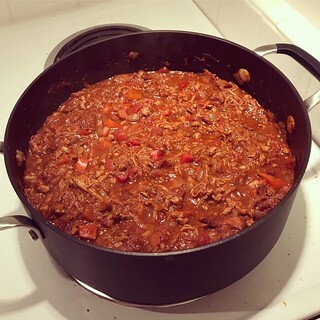 So as easy as it is to whip up a batch of chili that I’ll enjoy, this year I challenged myself to make something that folks would absolutely love. Of course was going to include bacon, but why stop there? I started with the general concept of my bacon chili, but I replaced the ground beef with ground pork. However, there still seemed to be something missing. Two kinds of pork just wasn’t enough! 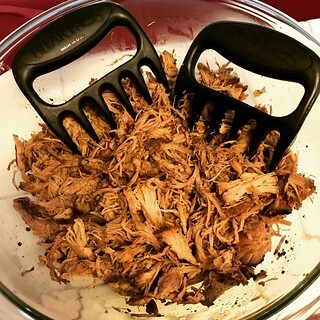 So in order to turn this recipe up to eleven, and also make the texture something different from my usual chili, I decided to add some delicious homemade carnitas. The spices in the carnitas are complimentary to my chili seasoning so it seemed like the perfect fit. So I ultimately ended up creating this triple pork chili, aptly named Three Little Piggies chili by my friend Anjanette, to take to work for the cook-off and the rest is history! Second place in the judge’s favorites was a much better showing that I ever expected. Not bad for a mild chili. I’ll have to come up with something even crazier next year! 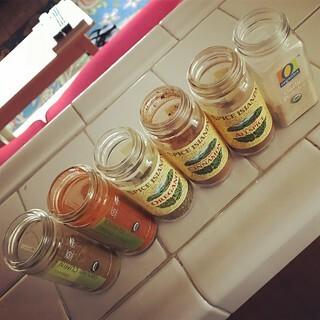 In a small bowl, combine the spices (chili powder, cumin, paprika, oregano, allspice, cinnamon, salt, garlic powder, black pepper, and cocoa powder) and set aside. This will save you time and trouble later. Cut the bacon into 1/2 in pieces. In a large pot (I have an aptly named chili pot that I love), cook the bacon over medium heat. Use a splatter guard if you have one because that bacon grease is hot! Once the bacon pieces are crispy (watch carefully because they can burn quickly! ), remove them from the pan with a slotted spoon and set aside for later. Add the ground pork, diced onion, and diced pepper to the pan with the leftover bacon grease and cook over medium heat until the pork is cooked through. Add the bowl of spice mix from earlier and cook, stirring frequently, until fragrant, about 2 minutes. Add the apple cider vinegar, Worcestershire sauce, diced tomatoes, tomato sauce, and reserved bacon and stir to combine. Finally, add the carnitas and stir to combine. I am not exactly sure how much I added, but I’m guessing about 3/4 lb. Add more or less to your taste. Bring the chili too a boil and then reduce heat to a simmer. Put the lid on the pot, but leave it propped open a bit so steam can escape. Cook for 90 minutes, stirring about every 15 minutes. Enjoy! Based on My Amazing Bacon Chili and My Cincinnati-Style Chili. 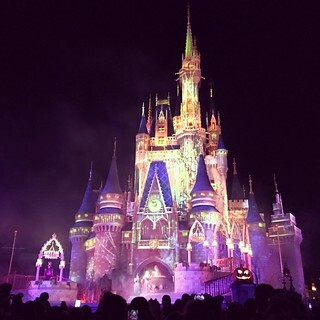 Halloween is always a busy holiday, but this year it was even crazier than usual. Not only did I have the annual chili cook-off at work, but was I leaving to go on vacation the next morning. I didn’t have a free minute all day. I got to work really early that morning to start warming up my chili which had been in my fridge since I cooked it a couple of days before. In addition to my own I was in charge of heating up a co-worker’s chili as well because he was out of town, but still wanted to be in the competition. I also wanted to be able to get some actual work done before the duties of the chili cook-off coordinator got too overwhelming. My chili this year was called Three Little Piggies chili, as named by my friend Anjanette, because it contained pork in three forms – bacon (maple bacon, even, which made it Whole30 non-compliant), ground pork, and carnitas. I didn’t get a chance to taste it until just before the chili cook-off judges started their deliberations, but I thought it was delicious. And thanks to my Whole30(-ish) experience ending the day before, I took advantage of no food restrictions and ate a lot of chips between breakfast and lunch. The chili judges I recruited (actually, two of then volunteered for the job a year ago!) made their rounds at 11 AM and used a very systematic, math-based method to choose their favorites. Then at 11:30 AM I opened up the buffet of 15 chili entries and all of the other food that people brought to the general public for lunch. The chili cook-off seems to grow in size every year so I was running around like crazy making sure that everything was going smoothly. I got in line for food pretty late and most of the Crockpots had already been practically licked clean, including mine. I still got to try a couple of chilis that weren’t too spicy and they were both delicious. 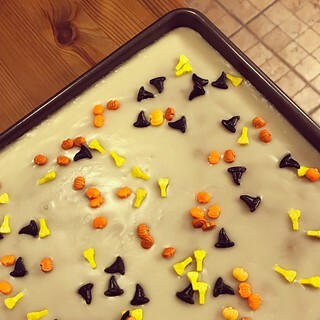 I also sampled a piece of the pumpkin sheet cake that I made and it was scrumptious. 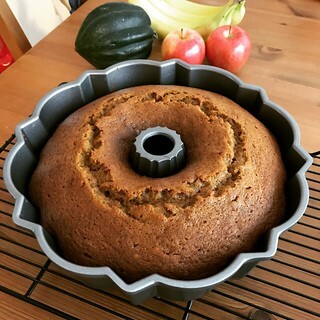 The white glaze on the pumpkin cake worked out really well. I will remember that for next time, but I’ll make sure to get some higher quality sprinkles! After everyone had eaten and voted for their favorite chili I announced the winners of the popular vote as well as the judge’s vote. Surprisingly, my chili managed to bring in 2nd place on the judge’s list! It just goes to show that adding bacon to a dish makes it infinitely more popular. I also tied with two others for 3rd place in the popular vote. Not bad for a mild chili since the top prizes usually go to the spicy entries. I wanted to go home at 5 PM in order to watch Game 6 of the World Series to see if the Dodgers could win and keep their season alive, but my workload had other ideas. I ended up staying until 7 PM while periodically checking in on the baseball game on ESPN GameCast. By the time I got home and turned on the TV to finish watching the game I knew there was no way I’d have time to go for a run that night. It was already late and I still had a lot to do. First of all, I washed all of the dishes from the chili cook-off as well as everything left over from making the pumpkin sheet cake the night before. That was a lot of work, but I didn’t want to leave them sitting in my sink for a week! And then I had to pack my suitcase for my trip to Orlando. I hadn’t done a very good job preparing for my vacation ahead of time so I had my work cut out for me, but at least all of the clothes I needed to take with me were clean. The Dodgers did manage to win the baseball game and force a World Series Game 7 so that was good, but I didn’t get to bed until bed around midnight. Phew! 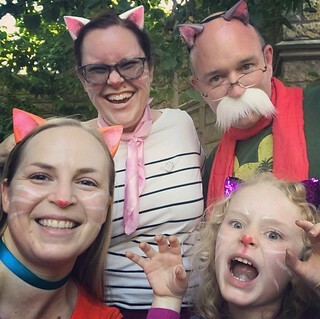 It was quite a Halloween this year! Before I can write about my prize-winning Halloween chili I first have to share this carnitas recipe because I put some if the pork in the chili. I don’t want to diminish the importance of this recipe, though. Not only is it Whole30-compliant due to being sweetened only with fruit juice, but it’s also incredibly simple and delicious. I ate this meat for many lunches during the month of October with roasted sweet potatoes and vegetables on the side, but it would be delicious in tacos if tortillas and cheese are included in your diet. When you don’t have a lot of free time your Crockpot can be your best friend. Slow cook a batch of carnitas either on the weekend or one day while you’re at work and you’ll have protein for days. Now that my Whole30(-ish) experiment is over I might add some BBQ sauce to the leftovers I have in the freezer for a little change of pace. I get tired of eating the same thing more than two days in a row so variety is important. I encourage everyone to customize this recipe any way they see fit. In a small bowl, combine the chili powder, cumin, oregano, salt, paprika, and pepper. I did this the day before to save time. Once you’re ready to put the pork roast in the slow cooker, rub the spice mixture on all sides. I cut my roast into two pieces to make this easier and to have more surface area for the spices. Put the onions into the bottom of the slow cooker, place the pork roast in next, and evenly distribute the garlic cloves on top. Pour the orange juice and lime juice over everything. Cover and cook on low heat for about 8 hours. Remove pork shoulder from the slow cooker and shred the meat in a large bowl, removing any large fat deposits that remain. Add some of the cooking juices from the slow cooker if you want. I did this because my batch would be refrigerated and reheated for lunches and I wanted to keep it from getting too dry. Add additional salt and pepper, if desired. I added a tiny bit of salt to my lunch portions and it was divine. Enjoy! Based on Damn Delicious’s Slow Cooker Pork Carnitas. After the usual ordeal of preparing for air travel I finally made it to LAX and sat down at my gate with my laptop expecting to be able to connect to wifi and update my webpage. Due to several factors yesterday was just too busy, and by the time I was able to think about blogging it was really late and I needed sleep a little before my flight today. However, when I got to the airport today my laptop wasn’t recognizing the LAX wifi connection for some reason. And then I discovered that internet access on my flight was $24! Needless to say, I didn’t pay that hefty price. So that brings me to the present, sitting in my Disney World hotel room for a few minutes to charge my phone before heading to Magic Kingdom for the Halloween party. After such a long day I’m taking advantage of this brief window of down time to publish this post. 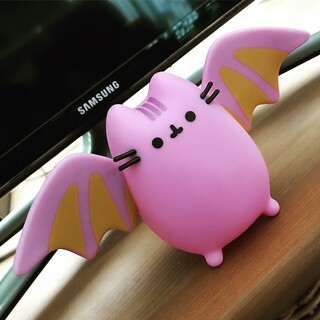 All throughout October I knew how busy Halloween was going to be for me. Not only was it the day of the annual chili cook-off at work, but I figured I’d be scrambling to finish getting ready for my trip to Disney World. Add a 12-hour workday on top of that and I barely had time to eat dinner last night! I’ll write more about that tomorrow. The point of this little rant is to explain why I planned ahead of time to share this year’s pumpkin bread recipe on Halloween rather than writing a more extensive post. So here it is! I mentioned this pumpkin bread last year, but didn’t deem it worthy of a formal recipe post at the time. This year I’ve used it twice and it’s absolutely the most delicious pumpkin bread I’ve ever made. The amount of spice is perfect and the combination of the pumpkin puree and pudding mix makes this bread incredibly moist. I took half a bundt cake to my Galloway running group’s end of the season breakfast a few weeks ago and they devoured every single crumb. Since I was doing Whole30(-ish) at the time I shared the rest with my co-workers and it disappeared in record time. I don’t know anyone who doesn’t like pumpkin bread, and this recipe is so easy to make and perfect for fall and winter. Just remember to grease the bundt pan or, as I learned firsthand, your cake will be ruined! Beat the eggs in a large mixing bowl with an electric mixer. Add the oil, pumpkin puree, and vanilla and beat until smooth. Add the cinnamon, nutmeg, pumkin pie spice, cloves, ginger, allspice, cardamom, and salt and beat until combined, scraping down the sides of the bowl with a rubber spatula as needed. Add the vanilla pudding mix and baking soda and beat until combined. Lastly, add the flour and sugar and beat until combined. Pour the batter evenly into a 12 cup bundt cake pan with every nook and cranny coated with cooking spray. This is important because you don’t want the cake to stick! (This happened to me the last time so I speak from experience.) Bake at 325 deg F for about 70 minutes or until a toothpick inserted near the center comes out clean. Cool for 15 minutes before inverting the cake onto a wire rack. Cool completely before slicing. Enjoy! Based on Taste of Home’s Delicious Pumpkin Bread.